Remember the photobooks I created for my boy Ethan a few months ago? I still love looking at the photobook, and of course, I love showing it to relatives and friends. Photobook has recently released the MyPhotobooks Editor 2.4.0, the latest version of the free downloadable Templateexpert Photobook Software that will allow you to create masterpieces with ease and simplicity. The new MyPhotobooks Editor 2.4.0 promises faster and more robust performance, with more layouts and templates to choose from. When I had my photobooks made, I was charged for shipping but now I am pleased to note that Photobook Malaysia is shipping for FREE to destinations in Malaysia and Singapore. This just MIGHT be the inspiration I need to start on my next photobook project. However, I was curious to find out if the individual prices for the photobooks had increased since. And my fears were confirmed! They indeed have! Nevertheless, a masterpiece like a photobook is definitely a keepsake worth making. And those with Paypal accounts can opt for that payment option too. Getting a beautiful photobook done is also a splendid gift idea for that special woman in our lives: Our Mother. From now till 31 May 2008, you can enjoy a 30% off all photobook orders, simply by entering the Coupon Code “MDAY30” when placing your order. So get started today! Here’s the loot I got from whatgreatskin.com! Remember I said I requested for many samples when I made my purchase with them? Well, I didn’t get all of them, but I am still elated, nonetheless…look how generous they were with the samples! Some are even new products that have not been launched in Malaysia yet! 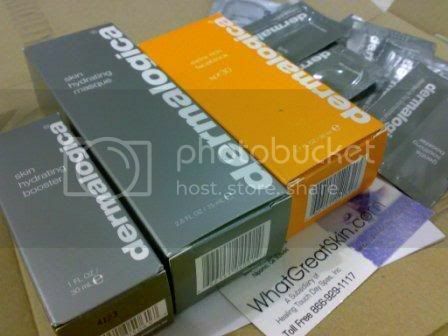 This is definitely a great site to shop for VERY affordable Dermalogica products at a VERY very special price! Yay me! With a few more days left for the Borders Anniversary Sale (which runs from 25 April -4 May 2008), I visited the store in Queensbay Mall yesterday hoping to get myself some books at a bargain. Oh okay, I lied. I didn’t *know* there was a sale going on till I walked in. Almost everything was on discount for at least 15%, even the books that were in the bargain bins. Actually I didn’t know that till I paid for them. There were also some good books going for 30% discount, but nothing caught my fancy, unfortunately or fortunately. 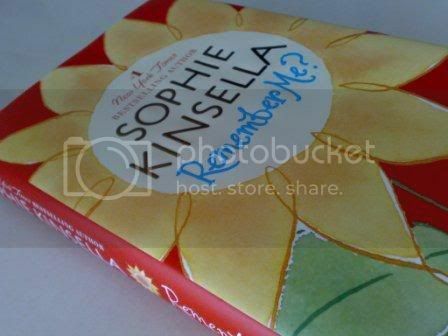 I got 2 books for Ethan, and Sophie Kinsella’s latest hardcover for myself (this one was a steal at 20% off). Bliss!Â I’ve already started reading it! You know how those sales gimmicks typically are? I’m talking about those stores that offer a discount for the SECOND item or the THIRD item, or if there is a “Buy 2 Free 1″ offer. Normally, the discounted item is the cheaper item, or in the case of “Buy 2 Free 1″, the 2 items you pay for are the 2 most expensive ones, yes? Because of this, I was indeed surprised to discover that Nose practises the total opposite. Yesterday, I was shopping for some flat shoes, which would make it easier for me to run around after Ethan, and I ended up in Nose. I still do not know why a store selling shoes would be called Nose (my hubby says it ought be called Feet or Toes or something along those lines). Nose is currently having this promotion that accords the 2nd item purchased with a discount of 20%. And when I clarified with the sales person, she told me that the more expensive of the 2 pairs of shoes would be considered the 2nd item, hence a bigger discount for the consumer. Was I happy as a lark! 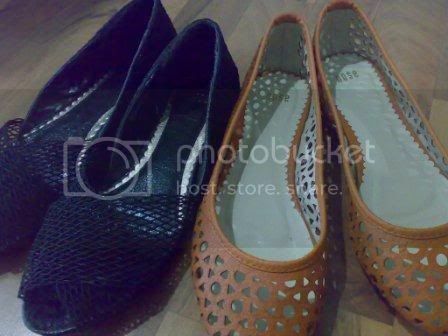 But unfortunately, the 2 pairs of flats I ended up with were the same price, so it didn’t matter anyway. Would you believe that these are my very first pairs of flats? Don’t you think that flats were designed with more of comfort in mind rather than fashion? Regardless…works for me! Yesterday, I had to get some craft material for my latest project (to be revealed soon), and the only place I know that sells a good variety of fabric is Kamdar at Bukit Jambul. It has been ages since I stepped into this shopping complex, and where once it was a center full with the hustle and bustle of activity, now it looked really dead and eeriely seedy. There were still some tiny shops open, but most of the sales promoters were yawning away, whiling their time away possibly not getting many customers. In places like these, I clutch my handbag a little more tightly than usual and quickened my pace. As I entered Kamdar, I started looking for the fabric I wanted, and I was glad that I had a very helpful sales promoter to help me. This Indian gentleman was very patient and took the time to explain everything to me in detail, showing me exactly where to find the fabric I wanted and even suggested where I could possibly check to broaden my choices. I walked out, confident that I had made the right selection based on my preferences, and knowing fully well, that every cent I had spent was worth it. It goes to show that no matter what you are purchasing, be it food items, craft material or even something specific like a picnic blanket, you need to be absolutely sure that you go to the right place for the right shopping experience.